Robert De Niro and gangster films are about as synonymous as Mark Hammil and Star Wars. They really seem to go hand in hand with one another. With films behind him such as The Godfather part II, Goodfellas and Analyse This, it would appear as though the role of a gangster was suited to Robert De Niro. With his tough and rugged look, Italian heritage and domineering presence on screen, it’s hard to argue otherwise. Even his terrifying role in Cape Fear, although not a gangster, was still that of a hardened criminal. But why exactly does he continue to get these kinds of roles? Has he been typecast, does he just fit the appearance, or could it actually be something else? 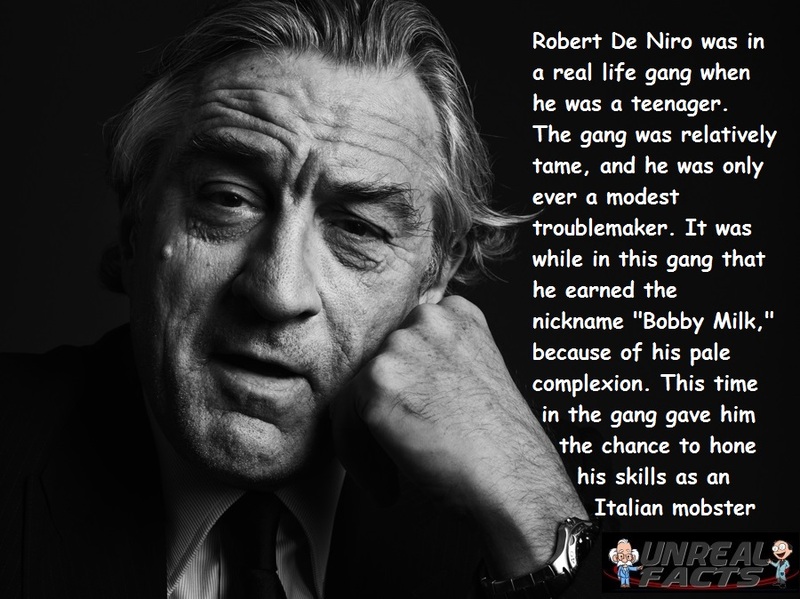 Well, believe it or not, but Robert De Niro was a gangster in real life. Alright, so we may be stretching the perception of gangster a bit here. Don’t go picturing him as one of his iconic characters, such as a young Don Vito Corleone or Paul Vitti, or as a true hardline mobster like Al Capone. The truth is that he was in a much tamer gang, but a gang nonetheless. As a teenager, Robert De Niro joined a New York street gang that earned him the nickname “Bobby Milk.” The name was in reference to his pale complexion. While the gang that he was a part of wasn’t exactly the covert, racketeering mobster type, he was involved in some very low-level troublemaking. In reality, the gang was so tame you would have trouble classifying it as a street gang today. So did this gangster life that Robert De Niro participated in as a teenager have any impact on his acting credentials? This is difficult to say with any certainty. You could argue that it did, as he got a taste of the real life street gang life, and it could have rubbed off in his portrayals as a Italian mobster. I would find it hard to believe, especially considering the number of mobster roles that he has under his belt, that it hasn’t had any impact on his work since.